The Ephs traveled to Florida for spring break and compiled a 12-1 record to start their season. The men upset No. 16 Johns Hopkins on March 22. Photo courtesy of Sports Information. After struggling during the 2018 season, baseball (13–4, 1–3 in the NESCAC) has shown remarkable improvement this year. Battling many injuries, the team ended last season with a record of 9–21. The men have already surpassed this win total less than halfway through the 2019 season. The season kicked off with a successful spring break trip to Florida. Despite playing a grueling 13 games over a 12-day span, the men managed to maintain their momentum throughout the trip. 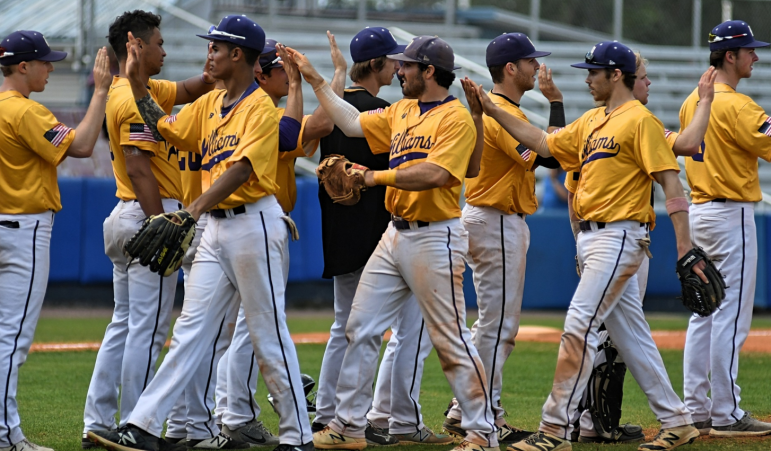 The Ephs began with a five-game win streak in Fort Myers. The fourth of these wins came against No. 16 Johns Hopkins on March 22, when the Ephs beat the Blue Jays 9-8. The streak ended with a loss to No. 18 Denison. After the loss, the team rebounded and went undefeated for the remaining seven games of the trip. First-year players attributed much of the team’s success to the leadership of upperclassmen. The team’s leaders have deliberately sought to cultivate a winning culture. Tri-captain Alex Panstares ’19 said that the process began long before the start of the season. The team says it is happy with what it has accomplished so far, but it is focused on sustaining its success throughout the remainder of the season. The team will seek to continue its successful season with a midweek contest at 4 p.m. today at Vassar in Poughkeepsie, N.Y., and a three-game home series against Middebury over the weekend.